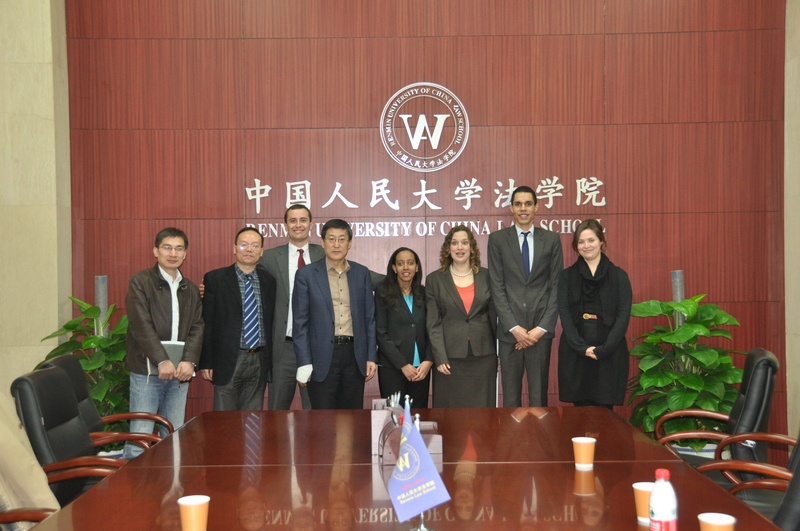 Renmin University of China had never seen anything like it before. 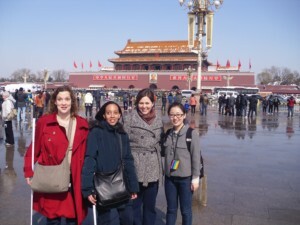 Judging from the countless people who gleefully snapped photos of us around the Forbidden City, people in Beijing had never seen anything like it before. 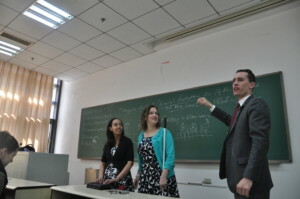 Renmin students and Chinese tourists all seemed surprised to see two confident blind Americans. Haben Girma and Tai Blas, both law students, spent a week sharing their passion for disability rights with Beijing’s disability law community. 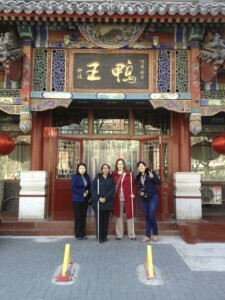 The cultural exchange sparked new ideas for both the Chinese and the Americans. With Chinese culture’s emphasis on uniformity and American culture’s emphasis on individualism, the cultural exchange facilitated a rich conversation about what should be done for people with disabilities. A social environment that would offer the most civil rights for people with disabilities would likely be one that combined aspects of Chinese and American cultures: a sense of community responsibility/togetherness that simultaneously valued individual differences. Dean Han of Renmin University Law School invited us to Beijing in hopes of inspiring his students to become civil rights lawyers, and to seek ideas for making his law school more accessible to students with disabilities. 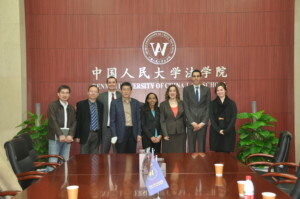 Dean Han and his wonderful Program Coordinator Ms. XU Fei, Renmin professors Charles Wharton and Alonzo Emery who are connected with the Harvard Project on Disability, organized a busy week of lectures and meetings at Renmin University, Zhicheng Public Interest Law Firm, and the National Library for the Blind. Professor Emery observed that the enthusiasm, humor, and welcoming curiosity utilized by Tai and I in our lectures created a safe environment for students to ask difficult questions. 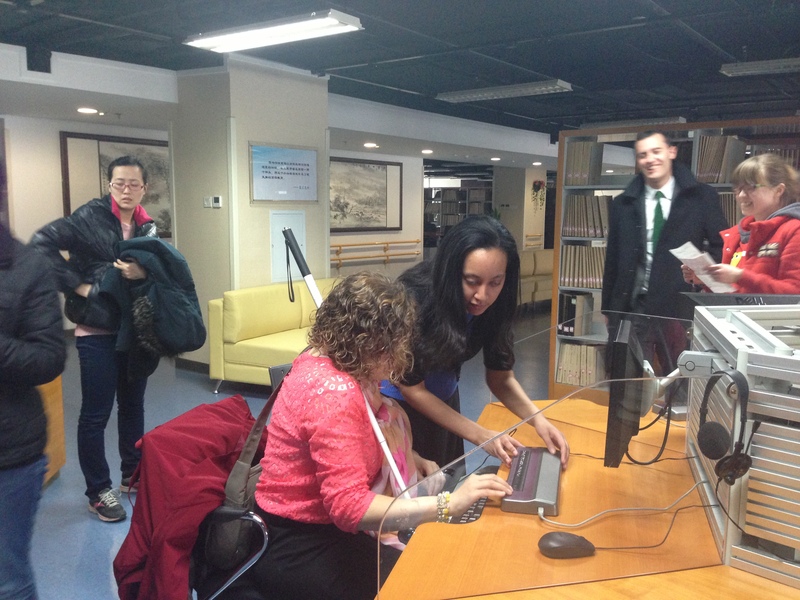 What employment opportunities exist for blind Americans? What is dating with a disability like in America? Is the world ready for disabled lawyers? Question: How do you experience a new place if you can’t see or hear? 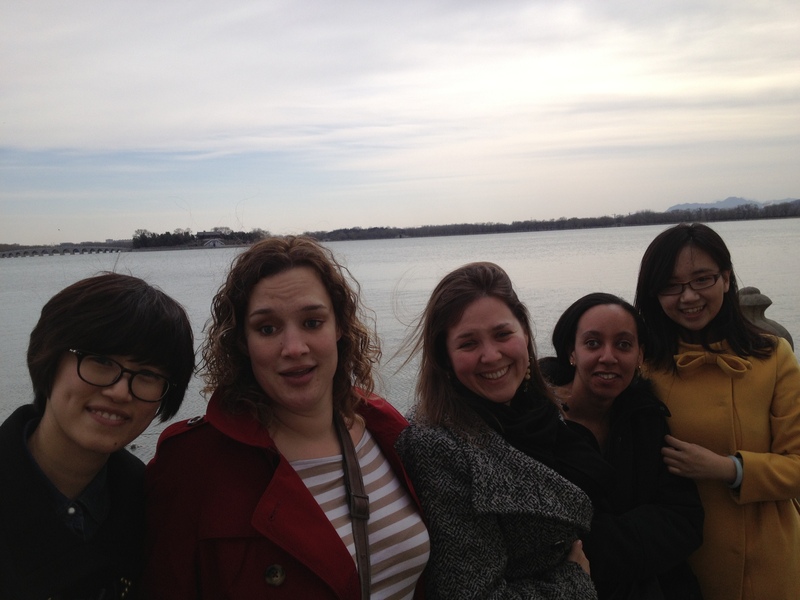 Haben’s Answer: For me, the most meaningful part of travel stems from meeting new people and learning new cultures. People describe the landmarks and historic sights, and I experience them that way. There’s more to it, though. 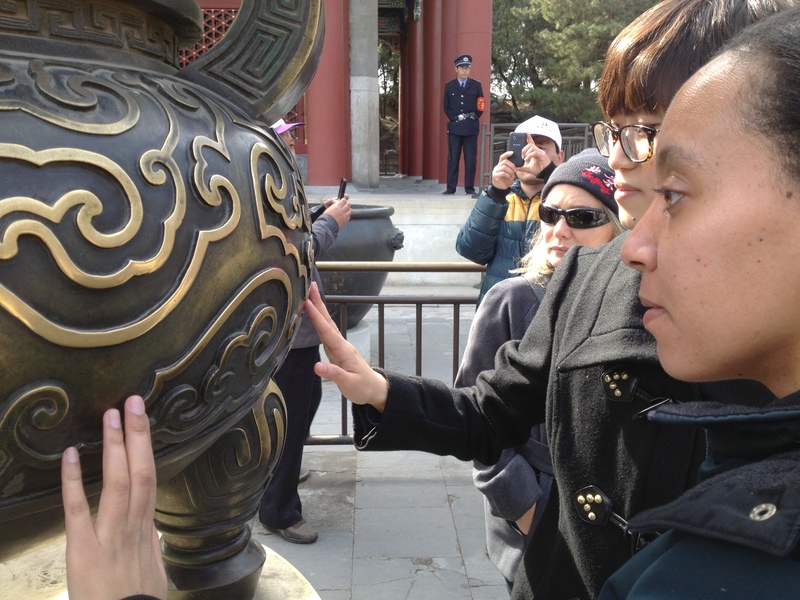 For example, yesterday at the Summer Palace we touched many of the statues and architectural features while our guides (Renmin students) told the history behind the Summer Palace. Walking around the lake, we could feel the breeze and smell the water. A man selling costume services showed us the traditional royal headdress. 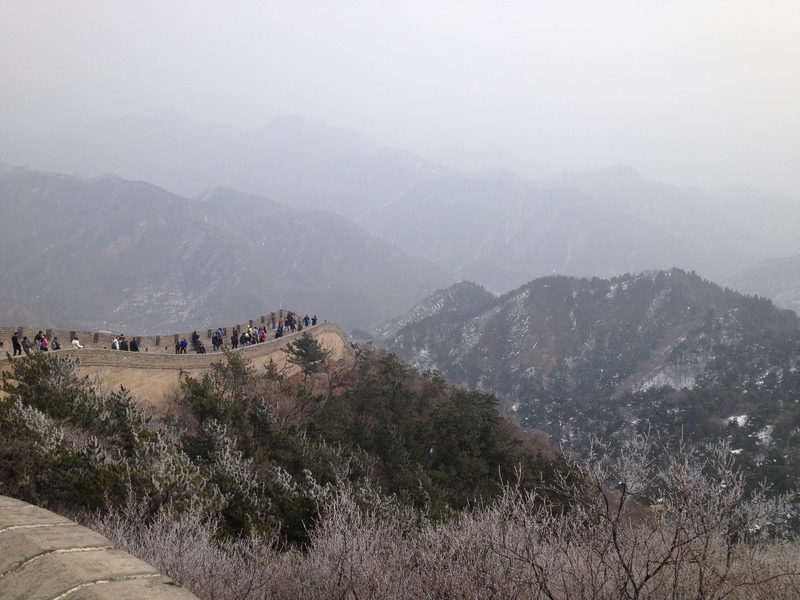 And then, of course, there is the ultimate travel experience that requires neither sight nor hearing: breathe in that thick smog and you instantly know you’re in Beijing! Question: But you are, in fact, different. So why should we treat you the same? Answer: What a good question! Should you pretend that someone who is balding actually has long hair? Should you require bald people to attend separate schools? No. Yes, blind people need help sometimes, although much less than you would think. 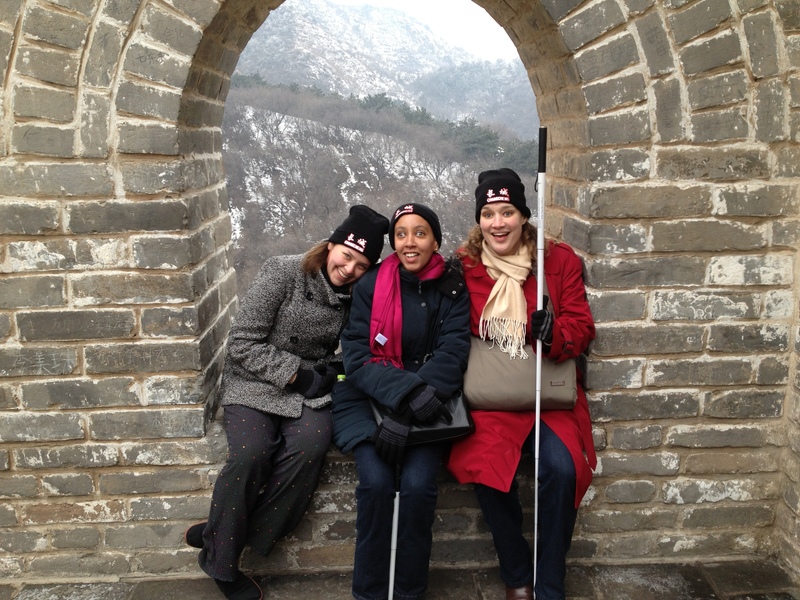 Yes, blind people are different from sighted people, but in less ways than you would think. Blindness is merely the lack of sight. A nuisance for sure, but it is merely the lack of sight. The biggest barrier to equality is the assumption that people with disabilities cannot do something. Since blind and sighted people are mainly the same, society should predominantly treat them the same. 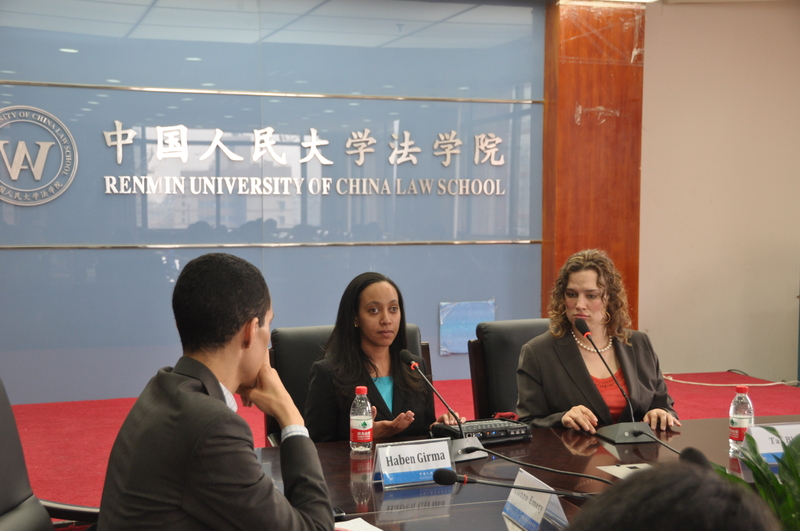 As the questions revealed, China is in the process of transitioning to a social model of disability. Dean Han is very dedicated to making his school more accessible. Not only did he invite two successful law students with disabilities to educate the Renmin Law community, but he and Vice Dean Wang spent an entire evening with us exchanging ideas for making law school more accessible. Renmin Law has not yet admitted blind students for multiple reasons. The national examination required for admission to colleges and universities in China is mostly inaccessible. Strict national exams have a long history in China. The current university entrance examinations continue the deeply rooted principle that fair exams are those in which everyone takes them in the same way and at the same time. Reasonable accommodations for students with disabilities appears to conflict, at least on the surface, with historic principles of fairness. Since the government, for the most part, does not permit disability accommodations on the national exam, very few students with disabilities are able to take the exam, and even fewer gain admittance to prestigious universities like Renmin University. While disability rights advocates have looked into ways of securing accommodations for these exams, the options are currently very limited. Tai and I talked with Dean Han about offering alternative admission criteria for students with disabilities until reasonable accommodations are available for the national exam. In the US, before passage of the ADA, schools would sometimes waive the LSAT requirement for blind law school applicants. 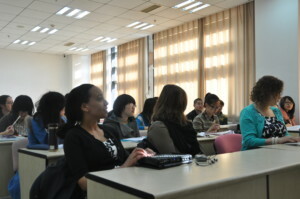 By admitting qualified applicants with disabilities, Renmin University could offer an education to students who could later become disability rights advocates who would secure more civil rights for all. Haben and Tai also discussed hiring faculty with disabilities to help generate more ideas for creating a more inclusive law school community. 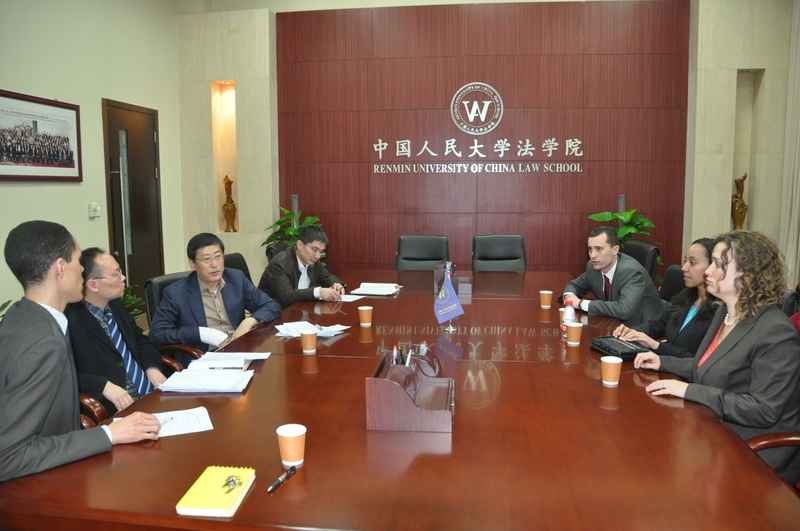 Dean Han and Professors Emery and Wharton at Renmin University’s Disability Law Clinic are working to increase access to education for people with disabilities, but they are not alone. Many other lawyers and advocates are working to promote disability rights. 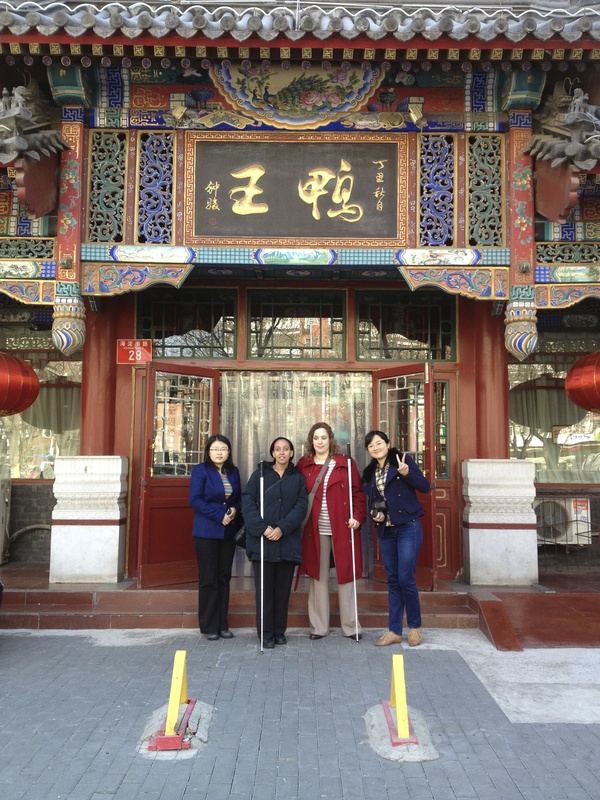 Many of these advocates shared their efforts with the rest of the disability law community during a conference at the Zhicheng Public Interest Law Firm. 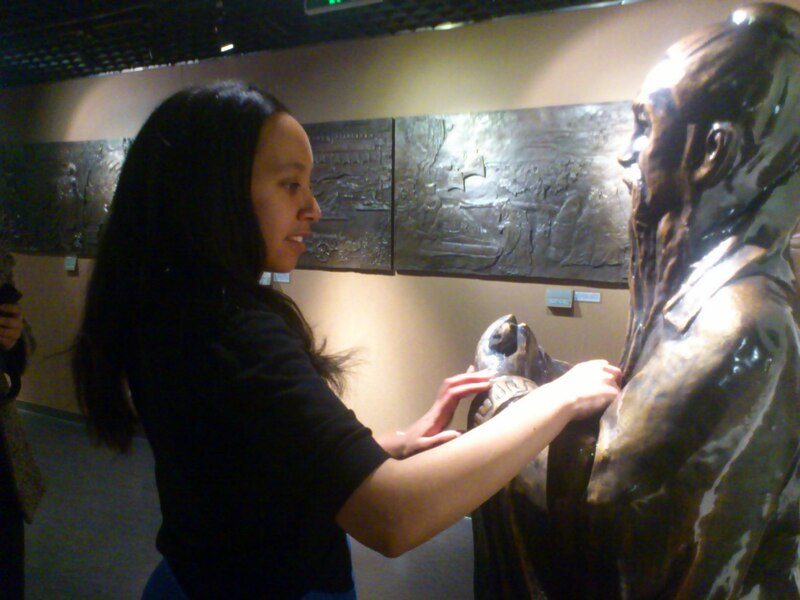 China’s Law on the Protection of Persons with Disabilities was passed in 2008. It is modeled on the UN Convention on the Rights of Persons with Disabilities, which China ratified while the US has not. Given that the Law has been in effect for only a few years, it is not surprising that advocates of students with disabilities expressed some ongoing concerns throughout the conference. Most schools require family members to help students with disabilities, which poses a serious challenge for working parents. In one case, a school would not provide school materials in large print for one student with low vision. Nonetheless, her grandfather dedicated extensive time to manually copying all her texts into large print so she could do her assignments. Many students don’t have family members available to dedicate their days to assisting in the classroom, and advocates felt that schools should take greater responsibility for students with disabilities. Currently, families are required to sign a liability waiver before a school will even admit a student with a disability. Some special schools have been created for certain students with disabilities that offer specialized materials, but these are few and far between. For example, Beijing’s sole school for the blind has the capacity to hold only 200 students, but the city’s entire population consists of a staggering 20 million people. 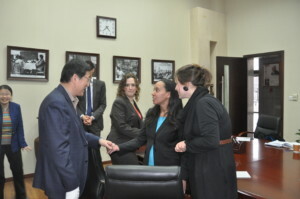 Renmin University arranged for us to meet the principal and some students from the Beijing School for the Blind. 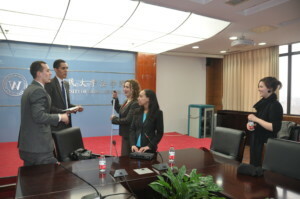 The room felt charged with excitement as two blind Chinese students met two American blind students. The mother of one of the blind students teared up a bit as each side began to ask the other questions. How did blind students go to school in America? 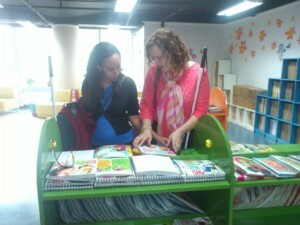 What did Haben and Tai plan to do when they finished school? Question: Do you have blind trails in America? Answer: No, we don’t, so it has been very fascinating to observe the blind trails here. Some of the major sidewalks in Beijing have a slight indentation trailing down the center. Construction of these trails aimed to assist blind pedestrians in following a sidewalk from one intersection to another. The trail will sometimes branch left or right in the middle of the sidewalk to lead to potentially helpful landmarks like a telephone booth. In metro stations the trail would branch off to gate entrances and agent counters. Rather than building blind trails in the US, state funds are made available to offer cane travel and guide dog training to blind individuals. 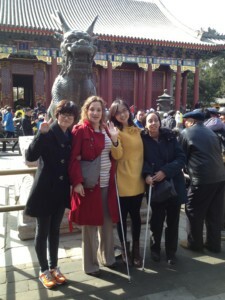 Blindness skills training seemed very limited in China, though. 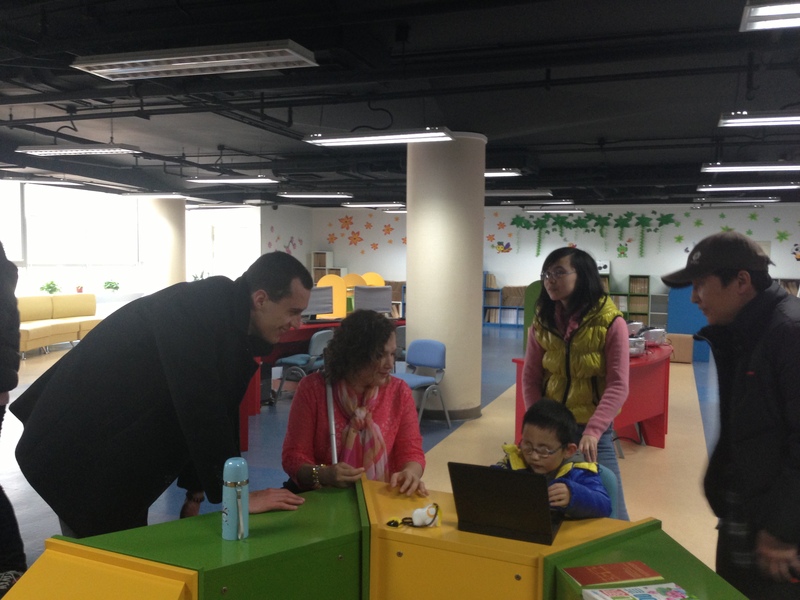 In turn, the principal Mr. Gao and the students answer questions about life in Beijing. While some students with low vision make their way through mainstream education with the assistance of family members and assistive technology, only at the school for the blind could students learn braille or cane travel. The high school program at the school for the blind offers two majors: piano tuning and massage. 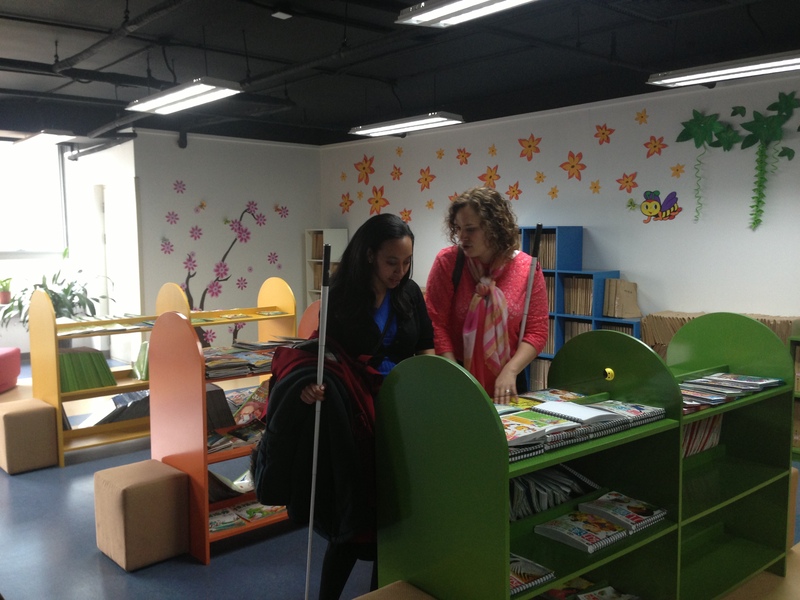 Masseuses earn about 30 RMB an hour ($5/hour) and piano tuners make over 200 RMB an hour (over $30/hour). A student explained that piano tuning involved a lot of heavy tools and travel, which discouraged some students from pursuing that major. The principal seemed very interested in enhancing education for deafblind Chinese children. Upon learning that deafblind children can in fact use sign language, he immediately sent an assistant to find the deafblind manual alphabet on the Internet. Haben explained that deafblind children could be taught to communicate through Chinese Sign Language–while sighted deaf students would process the information visually, deafblind students could place their hands over the signer’s hands so they could listen to Chinese Sign Language through their hands. Educational opportunities currently do not exist for deafblind children in China, but this meeting may have planted the seed for future deafblind educational programs. 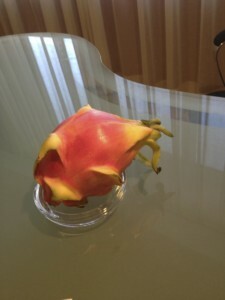 At the end of our meeting, Mr. Gao had a special surprise. Mr. Gao could read English braille, and at the end of the meeting he presented us with business cards that he had specially made with English braille! After the meeting, we were invited to tour the National Library for the Blind, which housed Chinese braille books, large print books, their own braille display called Sunshine, computers with text-to-speech software, video magnifiers, and an incredible tactile museum. 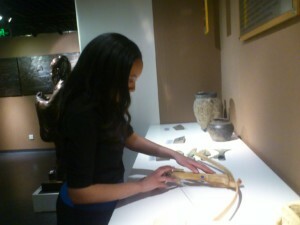 The museum held a diverse array of exhibits, from a giant hands-on solar system to ancient Chinese pottery. 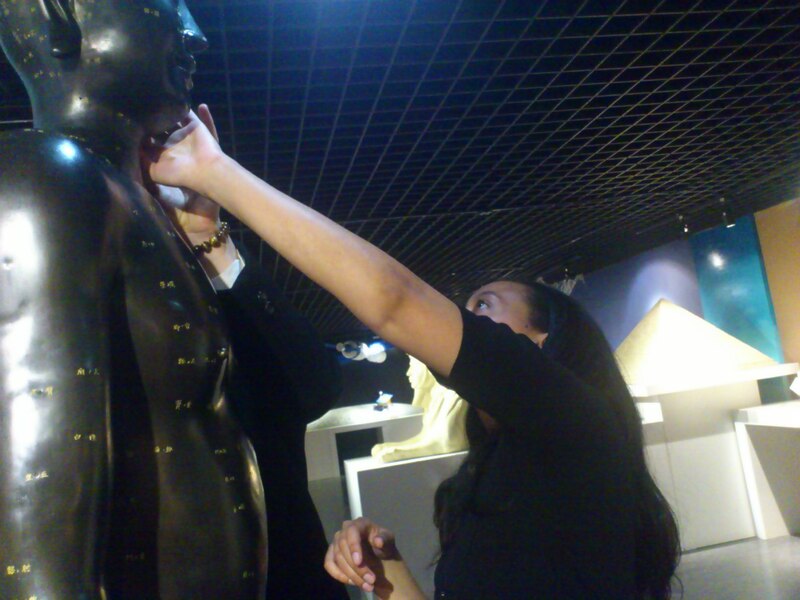 People interested in blind massage could find manuals in Chinese braille, as well as a large sculpture with indented pressure points. 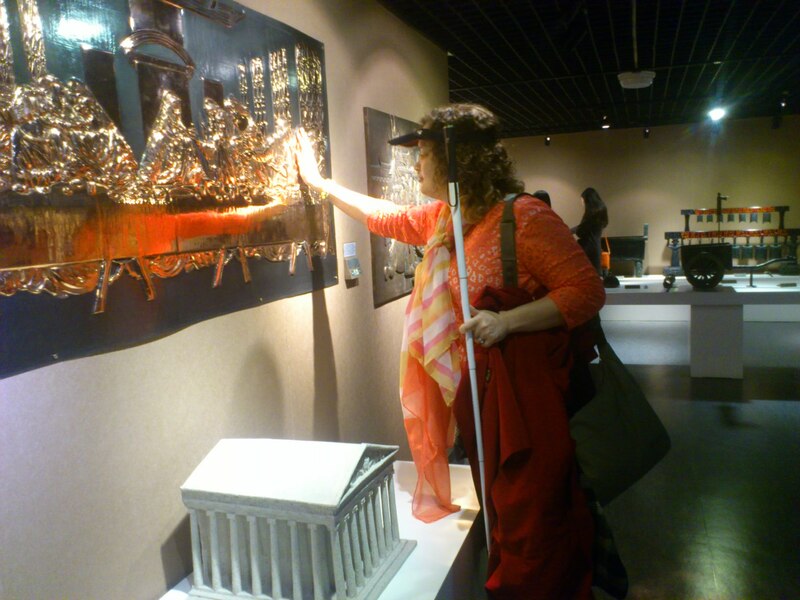 Especially noteworthy for blind visitors to Beijing, the museum has beautifully detailed models of the Forbidden City, Chairman Mao Memorial Hall, and the Olympic Stadium. Such a thrill to touch a model of the Forbidden City after touring the real thing only the previous day! 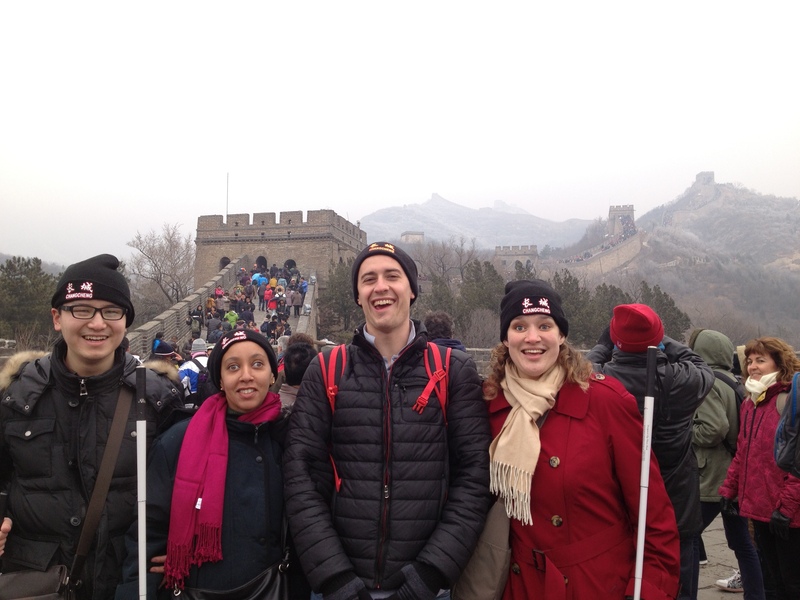 Our last great adventure occurred on our last day in China, and we invited blind journalist Wu Shuang to help us take over the Great Wall of China. 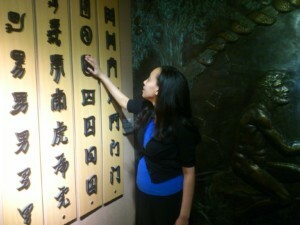 Wu Shuang worked for a national disability rights organization called One Plus One. Through their radio program and magazine, this group of disabled journalists work to empower people with disabilities throughout China. They advise people with disabilities on all topics from finding the courage to assert one’s independence in the face of overprotective family members to learning to find a job. Wu Shuang and several of his colleagues had listened to our talk at the the Zhicheng Public Interest Law Firm. During the talk, we stressed the importance of blindness training in order for blind individuals to develop the confidence that would allow them to negotiate any challenges. With good braille skills, confident cane travel skills, cooking skills, and all basic self-care skills mastered–blindness diminishes to a mere nuisance, clearing the way for individuals to tackle greater challenges. These principles of confidence skills training are applicable to other disabilities, too. 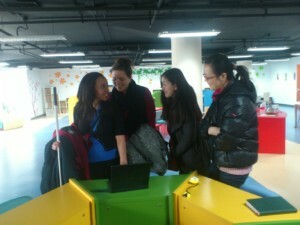 The One Plus One team immediately approached me after the talk with more questions. Which training centers are the best in the US? How much would it cost? 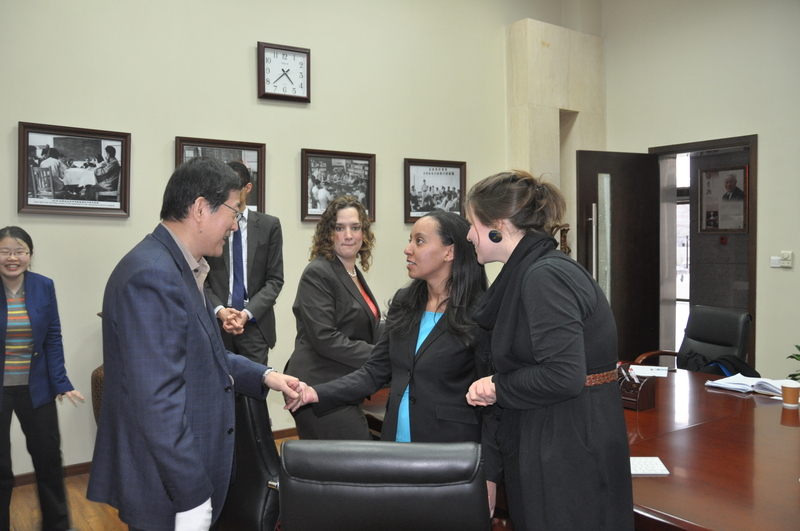 Then, to my surprise, they informed me that they plan to visit one of these centers and try to create one in China. Tai and I had actually been hoping to persuade them to do that, so the fact that they so fully embraced the idea was exciting! On the drive to the Great Wall, Wu Shuang told us more about the work of One Plus One. Some of the biggest barriers faced by people with disabilities are simply the misconceptions and negative attitudes society has towards disabilities. Negative social pressures are probably felt even more in China than in the US since Chinese culture values conformity so much. People with disabilities appear very different on the surface, especially those with physical disabilities. As a result, PWDs tend to experience stifling social pressure to not be different. How does one learn to assert their needs and desires in the face of both external and internal pressures to conform? Tai jumped in with the perfect quip, “One Plus One! (yī jiā yī! )” Of course two blind people are better than one! Laughing and cheering, Charles chose to chain it with two rather than one. With three canes, three Caucasians, one African, and only one Asian among us, our group could not have possibly been more conspicuous. 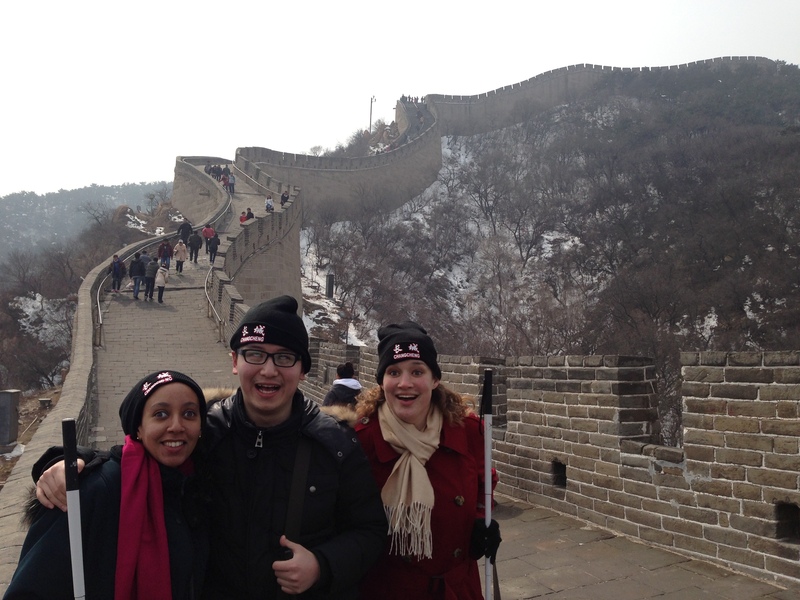 We subconsciously agreed to have a great time at the Great Wall–not a nice time or an OK time, but a GREAT time. Asserting our interests over the social pressures to hide our differences, we ignored the people who stopped, stared, and snapped pictures of our group. We didn’t hesitate to “be blind” by using our hands to admire turrets and carvings on the Wall. People noticed Charles and Cameron giving visual descriptions of the surroundings, and sometimes they chipped in, too. People observing us, as doubtless they were, gained a new set of images of disability as they observed us dancing and singing. Tai had been longing to learn a song in Chinese, so Wu Shuang provided a musical performance. The path up the wall had quite a few gullies, and Charles jokingly described my method of crossing these gullies to the others as The Haben Hop. I urged him to come up with dance moves for all of us, and so we had: The Charlie Cane Wave, The Shuang Sing, The Tai Stomp, and The Cammy Run. We descended the Wall laughing, doing our various dance moves, and taking turns being blind photographers. In the last stretch before our car, we linked arms and formed one long blind chain with Cameron at the lead and Charles in the middle with his eyes closed. 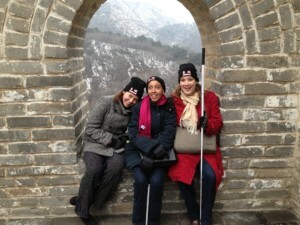 Climbing the Great Wall of China with fellow disability rights advocates held a special meaning. 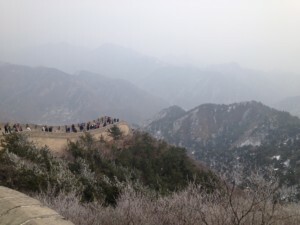 Our presence added a new history to the Great Wall, a wall that already contained thousands of years of special meanings. Who knows how disability rights in China might change after our week’s worth of learning, sharing, and exchanging ideas. 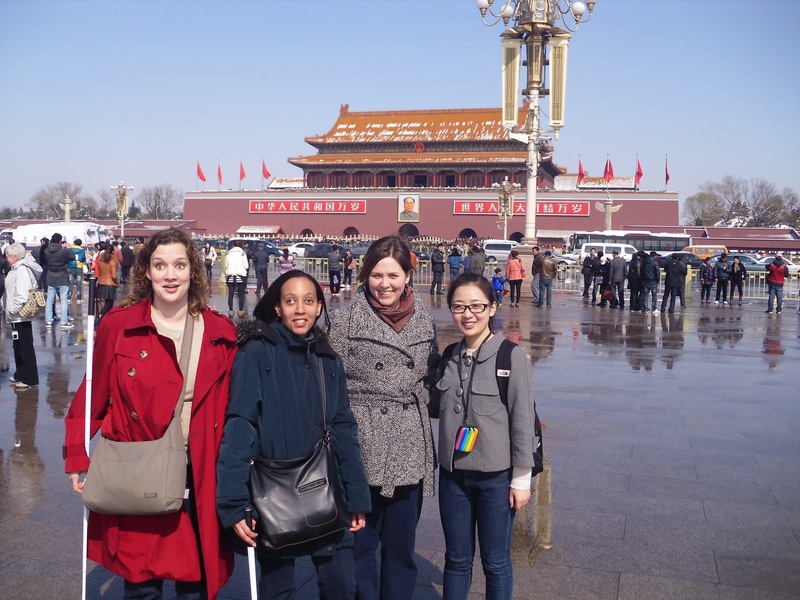 The decision of Renmin University Law School to organize a disability rights exchange created this wonderful trip with lasting benefits. 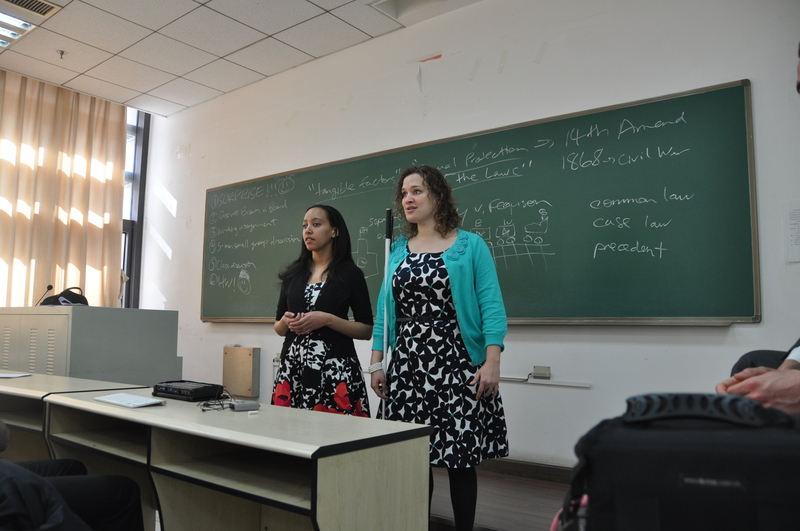 Students at Renmin University learned that people with disabilities are people who should be treated with dignity and respect. The school’s leaders learned about ways to overcome the inaccessibility of the national exam, such as by offering alternative admission options. Disability rights lawyers and advocates learned about the importance of confidence and independence training centers. In fact, members of One Plus One plan to visit a blindness skills training center in the US and build a similar training center in China. These are some of the concrete benefits, but so many benefits are hard to quantify. 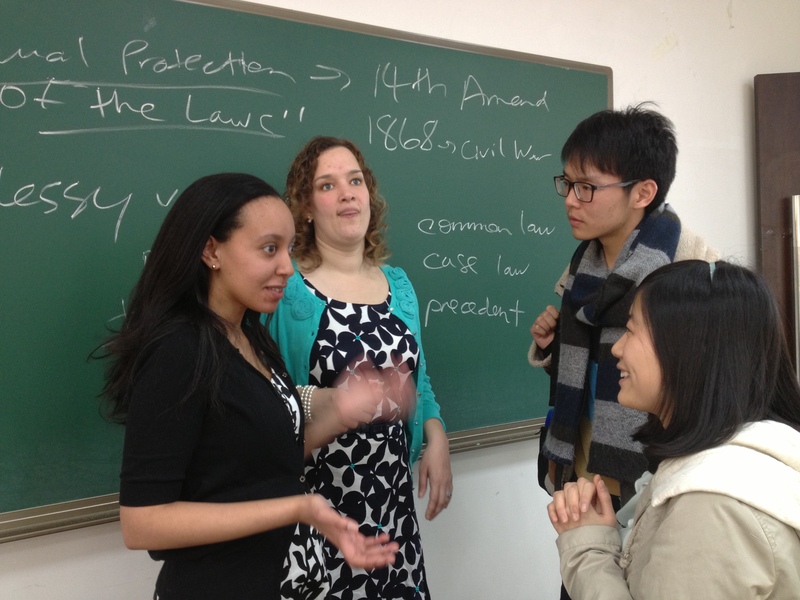 How many of the students last week felt inspired enough by our lectures to become disability rights lawyers? How do you quantify the ways in which the principal of the school for the blind felt motivated to envision careers for his students beyond massage and piano tuning, or even opening his school’s doors to deafblind children? It’s hard to put a finger on all the benefits of diversity, but I came home from China with an overwhelming sense of enlightenment. Before this trip, I hadn’t realized the fundamental importance of confidence and independence skills. A smartphone with text-to-speech and GPS certainly makes traveling easier, but even that would be useless if Tai and I had not received training in how to travel with a white cane, how to ask people for directions and thank them for their assistance. Expensive technology helps, but it is not necessary. Helen Keller made it through college with only a typewriter. Self-confidence allows people with disabilities to negotiate obstacles and educate inaccessible institutions. 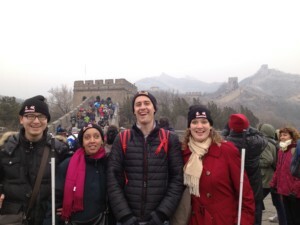 Due to the self-confidence developed at blindness training centers, Tai and I did not hesitate to have the greatest adventure of a lifetime in Beijing.